The Orfeó Català takes its place as the backbone of the OC-PMC foundation, with two pieces of news to strengthen and raise the profile of the overhauled institution. 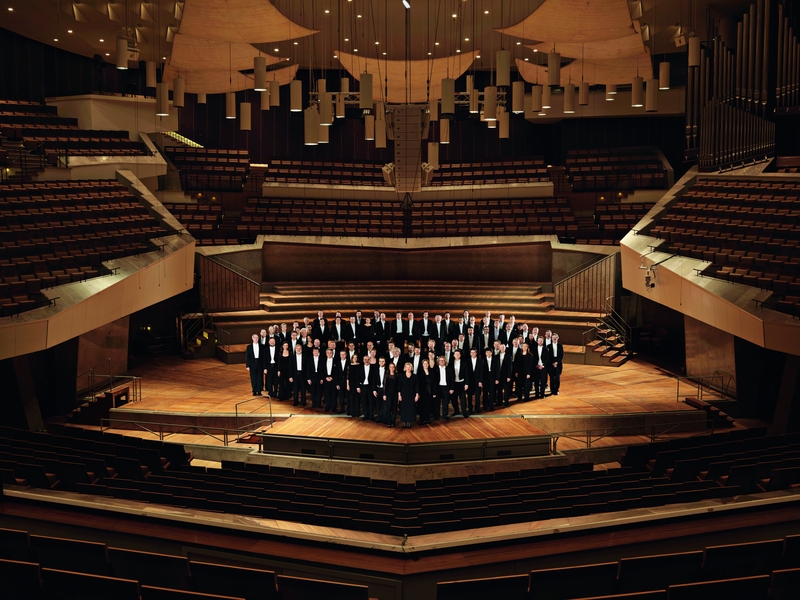 On the artistic side, and in line with its goal of excellence, the Berlin Philharmonic Orchestra (Berliner Philharmoniker) returns to the Palau de la Música with its senior conductor, Sir Simon Rattle, to perform for the first time in history with the Orfeó Català and the Cor de Cambra del Palau. 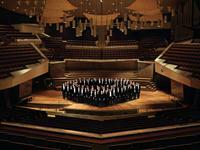 This exceptional, historic event opens the new Palau 100 season, and will take place on 1st July 2013, with a programme which includes Fauré’s Requiem and Schumann’s Second Symphony. Moreover, on the institutional side the OC-PMC foundation is overhauling its corporate identity, which brings the Palau de la Música and the Orfeó Català together for the first time under a single brand to foster their synergies. This relationship between the Orfeó (as an association and as a choir, with its founding and institutional values) and the Palau de la Música Catalana (an icon of Art Nouveau and a World Heritage Site) is what makes the institution so distinctive, turning it into one of the most authentic symbols of Catalan culture. The new brand positions the Palau and the Orfeó on the cultural and institutional scene, projecting a solid, unitary identity, as well as reinforcing their mission: to foster musical performance and training, heritage and social and cultural cohesion in the country. The new brand, designed by the Clase Bcn studio (founded by Claret Serrahima) is based on the essence of the Orfeó Català: its symbolism as a choir, as well as including abstract references to the Palau de la Música Catalana building. This new identity is to be implemented gradually in all the foundation’s published media, among which the new version of the Palau de la Música website is published; as well as the new image, this boasts new content, software and browsing to meet today’s needs and improve its positioning. Consolidation of the Orfeó Català choral season which, coming to its third year in 2013, helps to awaken interest among audiences in choral singing, with quality assured and in accordance with the founding spirit of the institution, and with the aim of offering outstanding performances by choirs from here and abroad. Qualitative improvement among the house choirs, by fostering training for the singers and bringing together the direction of the Orfeó Català and the Cor de Cambra del Palau under the leadership of Josep Vila i Casañas with the aim of creating synergies and establishing regular cooperation between the two ensembles. 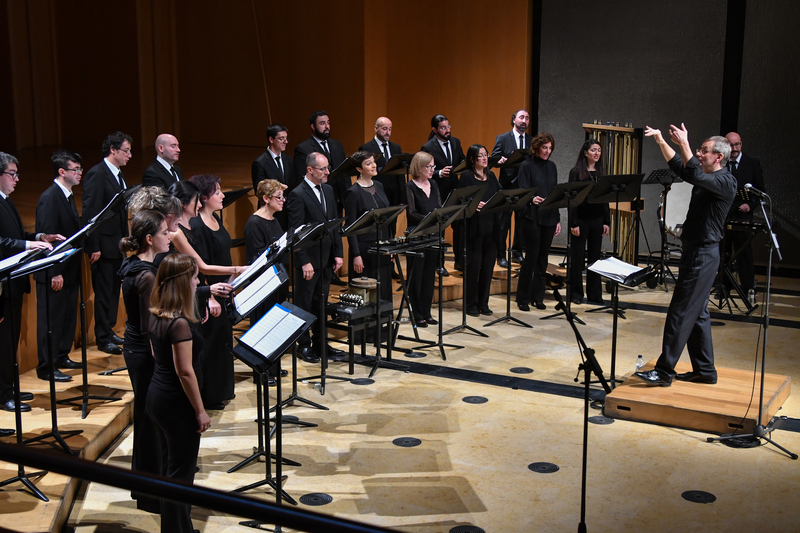 The two choirs reinforce one another to create and pursue a solid, stable musical project. 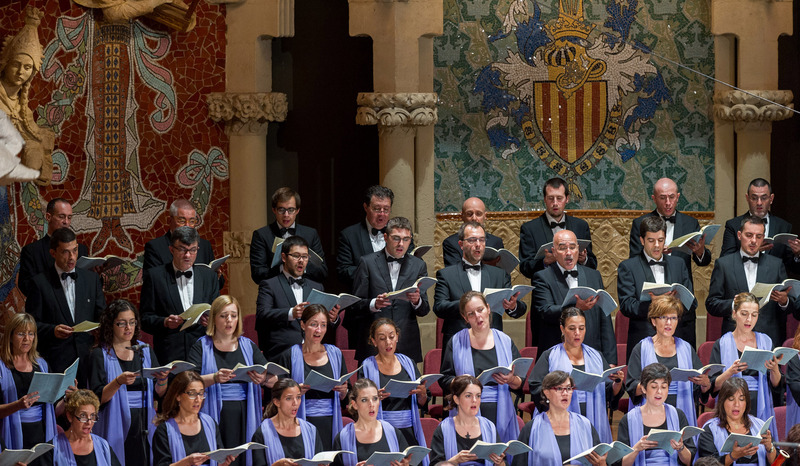 The Orfeó Català as an ambassador for Catalan music and culture, including exchanges with other choirs in the country in order to reach out to different localities around Catalonia, at the same time giving other choirs in the country the chance to perform in the Palau de la Música Catalana. Earning the Orfeó Català a place on the international musical scene: in June 2013 the Orfeó will be travelling to Vienna with the Cor de Cambra del Palau, to perform the Gurre-Lieder at the Konzerthaus with Kent Nagano and the Wiener Symphoniker, and in July it will be performing with the Berlin Philharmonic, conducted by Simon Rattle, to perform Fauré’s Requiem. The Orfeó Català is present in the new corporate image of the foundation. Ensuring a musical, social and public presence for the Orfeó Català, taking part in the documentary BCN3D by Manuel Huerga, cooperation on the charity Disc de La Marató 2012, the Christmas concert in the Plaça del Rei and the Eleventh of September concert. Unifying management of the three bodies (Association, Consortium and Foundation) in a single Orfeó Català-Palau de la Música Catalana foundation in order to streamline management, make the best use of resources and ensure openness. This new foundation, brought together in January 2012, for the first time includes in its governing body representatives of the Orfeó Català, of the institutions which made up the old Consortium and of the recently-created Council of Sponsors. Building up the Escola Coral, on the one hand by doubling its budget, and on the other by bringing the choir school into the Palau building itself, making clear the central role of the choirs and their educational work. Positioning the Palau de la Música Catalana among the top auditoria: in December 2011 it joined the European Concert Hall Organization (ECHO), the association for the principal auditoria in Europe, which forms a platform for open exchanges and joint reflection concerning the shared opportunities, new developments and challenges in the life of 21st-century concert auditoria. Setting up a Documentation Centre, that includes the Biblioteca i Arxiu of the Orfeó Català. A reference centre in terms of the handling of its musical holdings and collections, and providing better access to its contents, at the same time organising new activities aimed at dissemination to all kinds of audiences. This coming January the new project will start being publicised. Pursuing a Musical Project with a distinctive personality for the 2012-13 season, one which blazes a new trail in the Palau programmes through five artistic goals which interact with one another: excellence, the central role of the choirs, commitment to contemporary creative music, attention to Catalan performers and a desire to attract new audiences to the Palau. To illustrate the project, the first book of the 2012-2013 season was created, containing the OC-PMC foundation’s artistic goals and in which readers can see the coherence of its own concert programme based on classical music in the uniquely distinctive setting of the Palau de la Música Catalana, a World Heritage Site and home of the Orfeó Català. In management terms, highlights include measures to increase income and cut costs, focusing on the streamlining and viability of the structure of the building in general. By December 2012 all the measures implemented had led to a 20% reduction in the Palau’s structural costs. Work is soon to be carried out on the air conditioning and maintenance of the building. Pursuit of the Social Project, since 2011, through the Escola Coral, with pilot schemes consisting of setting up choirs in social organisations and schools in the Ciutat Vella district, where a high percentage of the population is in a socially vulnerable position. The full project and its future direction is to be presented this coming January. Pursuit of the new Educational Project of the OC-PMC foundation. A comprehensive programme started up by the institution in a dialogue with the Palau’s concert programme and its heritage. The aim is to consolidate a distinctive educational project, one which fosters public participation, relations between different generations, interaction with other disciplines and with the Palau’s musical programme, exploitation of artistic heritage and publication of educational materials and sessions.